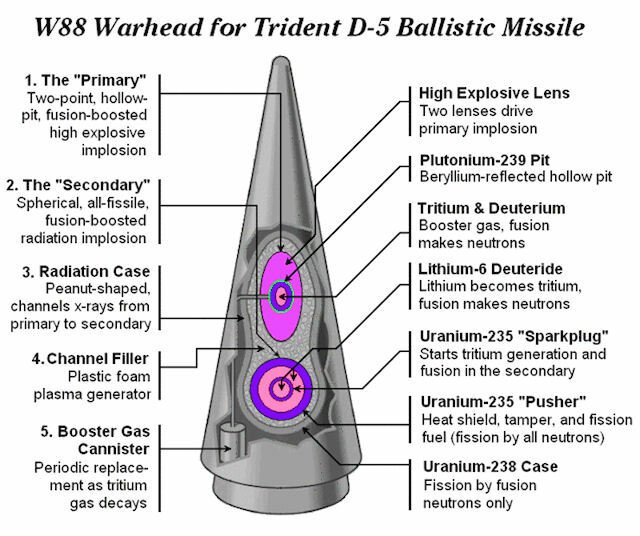 The W88 is a warhead used by the Navy on the Trident II missile. The W-88 is a miniaturized, tapered thermonuclear warhead. It is the United States' most sophisticated strategic thermonuclear weapon. 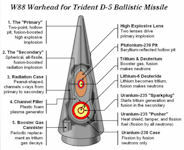 In the US arsenal, the W-88 warhead is mated to the D-5 submarine-launched ballistic missile carried aboard the Trident nuclear submarine. The Los Alamos National Laboratory program to develop the W88 warhead for the Trident II 5D missile was completed in 1989. The W88 is one of two types of warheads on US submarine launched missiles. There were nearly 400 W88 warheads in the stockpile and more than 3,000 W76s, the other warhead on US submarine launched missiles. The W78/88-1 LEP (Interoperable Warhead-1) objective is to deploy an interoperable nuclear explosive package for use in the Mk21 intercontinental ballistic missile and the Mk5 submarine-launched ballistic missile aeroshells, with adaptable non-nuclear components. This LEP is referred to as the first interoperable warhead option, the Interoperable Warhead (IW-1). IW-1 LEP specific activities are scheduled to recommence in FY 2020 to achieve a first production unit in FY 2030. The IW-1 LEP, after deferral, is slated to recommence in FY 2020, compressing that period slightly, in part to account for the work accomplished in FY 2014 and before. To avoid an unexecutable “ramp” in funding from FY 2020 through FY 2021, additional funding has been added in the FY 2022 through FY 2029 period to provide the nominal funding profile with the required amount of funding in advance of the first production unit. During the investigation into alleged Chinese espionage against the US nuclear weapons programs, it was disclosed that modern US hydrogen bombs use a non-spherical core. This is apparently a key technique in building miniaturized warheads. Two-point detonation is used on warheads like the W88. 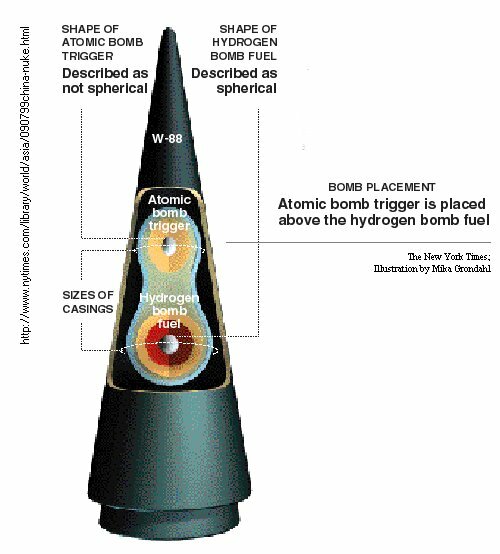 The W-88 has a non-spherical primary [the fission atomic trigger], a configuration first used in the W47. The primary is situated in the nosecone's narrow forward end [an arrangement used previously in some but not all American warheads]. The lithium fuel of the secondary has a spherical shape. The deployment of W88 warheads on the Trident D-5 missiles was slowed by the closure of the Rocky Flats plutonium processing plant in November 1989 due to safety and environmental concerns. At the time, independent unofficial esimates were that only 400 Mk 88s had been produced before the plant closed, versus the originally planned. Rear Admiral Raymond G. Jones Jr. has stated that there are enough Mark-5/W88 warheads to outfit four east-coast Trident submarines, with the remainder loaded 100-kiloton Mark-4/W76 warheads. This would imply that a total of nearly 800 of the W88 weapons had been produced, with each submarined loaded with 192 warheads [8 each on 24 missiles]. The FY2003 NNSA budget request provided for adding as many as 10 new W88 warheads to the stockpile per year beginning as early as 2007. In 2003 Los Alamos delivered the first certifiable W88 pit from the interim pit production capability. This was the first certifiable pit made by the United States since the shut down of Rocky Flats in 1989. In 1990 a panel established by the House Armed Services Committee and chaired by Dr. Sydney Drell of Stanford found that there was a significant danger that a W-88 warhead would detonate by accident. There were three serious design issues with the W88, according to the "Report of the Panel on Nuclear Weapons Safety," written by Sidney Drell, John Foster, and Charles Townes for the House Armed Services Committee, completed in December 1990. First, the warheads on the D-5 are mounted in close proximity to the rocket motor, arranged in a circle around the missile's third stage. The warheads on other American ballistic missiles are mounted on a platform which provides some insulating material between the warheads and a fuel fire. The rocket motors use a highly volatile 1.1 class propellant, which can both burn and explode [it is almost impossible to detonate a 1.3 class propellant]. Second, W88 designers had to choose whether to use the traditional high explosives [HE], or the safer insensitive high explosive [IHE], which possess a unique insensitivity to certain abnormal environments, such as fires, crashes or unexpected impacts. Unlike the conventional explosive, IHE is extremely unlikely to detonate in any of these crises. It also is not used in the D-5 missile system. Third, the Drell Panel was also concerned that in choosing the plutonium pit in the W88 warhead did not include Fire Resistant Pit which includes materials which can withstand temperatures of 1000 degrees Fahrenheit [however, since rocket fuel burns at 2000 degrees Fahrenheit, the Fire Resistant Pit isn't much safer than a regular pit when used in a warhead carried by a missile]. The Navy implemented Drell Panel recommendations to change Trident-II missile handling procedures, and the Department of Energy continues to improve the three-dimensional computer codes to predict warhead behavior in abnormal environments. The W88/Trident-II system was included in a Special Stockpile Improvement Review undertaken by the Nuclear Weapons Council. Flight tests involve the actual dropping or launching of a weapon from which the nuclear components have been removed. DOE uses specially designed equipment-referred to as telemetry packages-to test the integration and functioning of the weapon's electrical and mechanical subsystems. Only 3 W88 stockpile flight tests (of the 12 planned) were conducted during the 4-year period from fiscal year 1992 through 1995. Flight testing of W88 warheads taken from the stockpile was halted for more than 1 year because an important safety study required for disassembly and inspection of the warhead at DOE's Pantex plant lacked approval. A Nuclear Explosive Safety Study is required for each weapon type before DOE's Pantex Plant can disassemble and inspect a weapon selected for testing. Without disassembly and inspection capability, surveillance tests, including flight tests of sample warheads from the stockpile (the nuclear components must be removed and replaced by the telemetry equipment), cannot be conducted. DOE and national laboratory officials were not concerned about the reliability of the W88 warhead because they have collected considerable data over the past few years by testing W88 warheads that had never been placed in the stockpile. Because the W88 warhead is a relatively new weapon, DOE officials believe that the information from these "new material" tests provides good reliability data. 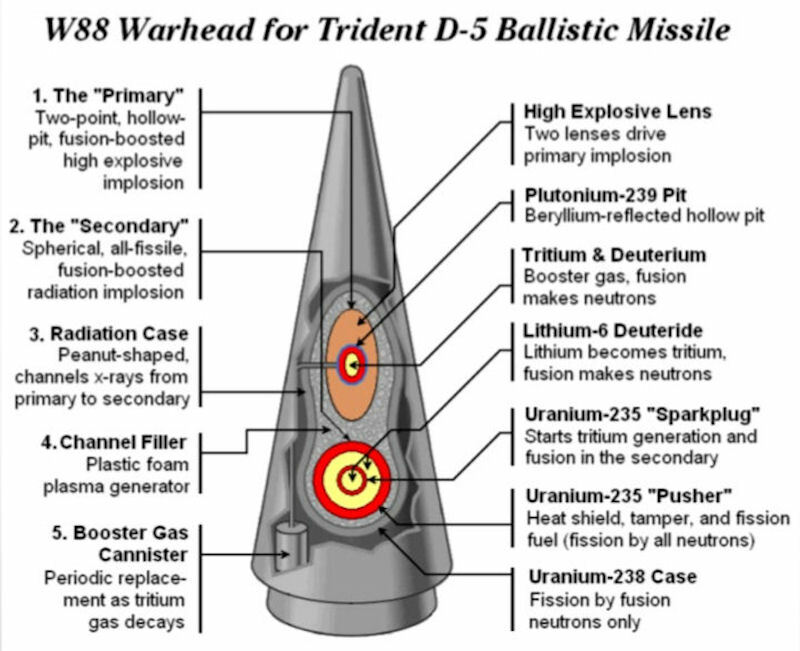 During the mid-1990s the W88 warhead was considered by DOE to be of concern in relation to nonnuclear systems laboratory tests. These tests involve testing the nonnuclear systems-such as the radar systems and fuzes-in the weapon to detect defects due to handling, aging, manufacturing, or design. DOE officials said the Department should have conducted about 28 laboratory tests, but over during the 4-year period from fiscal year 1992 through 1995, only 15 (or 54 percent) tests were performed. According to DOE and national laboratory officials, the tests were not conducted because of the absence of an approved safety study at Pantex. In 1999 it was reported that China had received secret design information for the most modern U.S. nuclear warhead-the W88 warhead, which sits atop the submarine-launched Trident II ballistic missile, and un-named US officials said "the top suspect is an American scientist working at a U.S. Department of Energy weapons laboratory." Edward Curran, the Energy Department's new counterintelligence director, said that "Department labs 'have the best computers and the smartest scientists in the world . . . without a question they are the No. 1 target' for foreign countries trying to steal U.S. technology." On 09 March 1999 Wen Ho Lee, a Chinese-American computer scientist who worked at the Los Alamos National Laboratory in New Mexico, was fired by the United States Energy department on suspicion of stealing nuclear secrets. The abrupt closure of the Rocky Flats Plant in 1989 stopped production of W88 pits before sufficient pits were produced to meet the stockpile surveillance requirements for the projected 20-year design life of the W88 warhead. A pit is the fissile core of a nuclear weapon's physics package. In the near term, DOE's Pit Manufacturing and Certification Campaign is focused mainly on W88 pit manufacturing and certification and planning for a Modern Pit Facility. However, in addition to meeting the W88 surveillance requirements, the NNSA is committed "to reestablishing and maintaining sufficient levels of production to support requirements for the safety, reliability, and performance of United States nuclear weapons" as delineated in the January 26, 1996, START II Treaty Ratification Text. As of 2001 the United States was the only nuclear weapons state that cannot produce plutonium pits for its weapons. Milestones continued to slip for production and certification of a plutonium pit for a W88 warhead at the interim Los Alamos TA-55 facility. Conceptual design work for an adequate long-term facility continues to be delayed. Production and certification of plutonium pits remain congressional interest items. For the FY2002 pit manufacturing and certification campaign, the House Armed Services Committee recommended the budget request of $128.5 million, including $122.5 million for W88 pit manufacturing and certification, $4.0 million to begin the task of understanding manufacturing and certification requirements for other stockpile warheads, and $2.0 million to support pre-conceptual design activities in support of a modern pit facility. Only one W88 warhead surveillance pit remained for destructive testing purposes but good progress was being made toward establishing a limited manufacturing capability at Los Alamos National Laboratory, with production of certifiable pits scheduled to begin in fiscal year 2003. In contrast, W88 pit certification has slipped from fiscal year 2007 to fiscal year 2009, with no commitment to meeting the latter date. This reflected both the difficulty of certifying a pit with extremely high confidence in the absence of nuclear testing, as well as the potential national security consequences of a failure in this area. In the absence of nuclear testing, the fabrication and certification of pits that meet quality requirements for the nuclear weapon stockpile war reserve remains a major challenge. The W88 Pit Manufacturing and Certification Integrated Project Plan, March 2001, has identified approximately 18,000 activities and 350 individual work packages to complete the pit production and certification task reflecting the magnitude of this major challenge. Plan the design and construction of a Modern Pit Facility to support long term pit manufacturing. The early years of the pit project are dominated by manufacturing process development for the W88 pit. During this period, certification tests are focused on examining fundamental plutonium properties and developing an approach to certification without nuclear testing. Following successful completion of process development pits and establishment of the requisite quality assurance infrastructure, the first certifiable pit will be fabricated and followed by the fabrication of qualification and production pits. During the ensuing qualification period, certifiable pits will be manufactured at LANL for use in experiments to demonstrate equivalence with Rocky Flats produced pits. A minimum set of certification experiments to determine product equivalency have been identified. Development pits will be manufactured while manufacturing processes are defined and qualified. As a part of reestablishing the capability to manufacture war reserve pits, the production controls and quality infrastructure necessary to meet quality requirements and consistency of product will be established. Once completed, the first Qualification Pit will be manufactured as a "certifiable" pit. Further Qualification Pits will be manufactured to support engineering and physics testing for certification of the manufactured pits. To confirm nuclear performance of the W88 pit without underground nuclear testing, the W88 Pit Manufacturing and Certification Integrated Project Plan (W88 PMCIPP), March 2001, identifies the required engineering tests, physics experiments, dynamic experiments and integral experiments. A thorough peer review of the plan and activities required for W88 pit certification and manufacturing will be performed. Engineering tests will be identified and scheduled for use in evaluating: the intrinsic radiation signature. plutonium hydriding structural response to environments delineated in the Stockpile-to-Target-Sequence including deployment and flight thermal and mechanical environments, pressure effects, and long-term material compatibility Physics laboratory experiments will be planned and scheduled to confirm that Los Alamos National Laboratory plutonium fabrication techniques produce equivalent compositions, microstructures and mechanical properties when compared to Rocky Flats manufactured material. Data from these material property experiments will be used to confirm consistent production results; to improve physics models used in ASC simulation codes; and to help predict and compare military performance. Integral tests will include explosively driven experiments to extrapolate material performance models in more realistic weapons environments, provide data to compare Rocky Flats material properties to LANL material properties, and to assist in development of advanced diagnostic techniques for more complex follow-on experiments. Additional integral dynamic tests will use actual geometry experiments to quantify performance differences that may result from differences in manufacturing between Rocky Flats and LANL. These experiments will also be the principal basis for computational ties to the prior nuclear test database. Pit manufacturing and certification activities not specifically supporting the W88 are conducted in the third element of the restructured campaign. These activities include identifying and scheduling the reestablishment of key manufacturing technologies for the W87 and B61-7 pits which, together with the W88, span technical variations of pits within the stockpile. This activity also provides technology development spinoff for the Modern Pit Facility. The limited manufacturing capacity being established to support the W88 requirements is insufficient to meet manufacturing requirements for the long term support of the stockpile. In addition, the capability to manufacture pits is essential to replace pits that are destructively evaluated as part of surveillance activities or to replace pits that have exhibited unacceptable aging effects. Planning for a modern pit facility with the capability to meet requirements is essential to establish a viable readiness posture. The conceptual design scheduled to begin in early FY 2002, subsequent to a critical decision validating the mission need, will be postponed. The FY 2003 budget request would allow for continued planning activities. In mid-2003 the Department of Energy's (DOE) Los Alamos National Laboratory (LANL) successfully made the first nuclear weapons "pit" in 14 years that meets specifications for use in the U.S. stockpile. The plutonium pit, called Qual-1 because it was built with and fully met qualified processes, is for the W88 warhead, which is carried on the Trident II D5 Submarine-Launched Cruise Missile, a cornerstone of the US nuclear deterrent. The six-year effort at LANL's plutonium processing facility restores a US capability lost when DOE's Rocky Flats Plant shut down in 1989. DOE identified LANL as the site to make nuclear weapon pits through the 1996 Stockpile Stewardship and Management Environmental Impact Statement. Under the W88 Pit Manufacturing and Certification Integrated Project Plan, the major focus of FY 2004 activities is preparation for integral experiments in FY 2005. The experiments have been re-baselined to support the acceleration of W88 pit certification from FY 2009 to FY 2007. Following passage of the FY 2003 appropriation,this schedule will be reviewed. FY 2004 efforts will focus on the following activities to support pit certification.Engineering tests will be identified and scheduled for use in evaluating: the intrinsic radiation signature; plutonium hydriding; structural response to environments delineated in the Stockpile-to-Target-Sequence including deployment and flight thermal and mechanical environments;pressure effects; and long-term material compatibility. Physics laboratory experiments will be planned and scheduled to confirm that LANL plutonium fabrication techniques produce equivalent compositions,microstructures and mechanical properties when compared to Rocky Flats manufactured material. Data from these material property experiments will be used to confirm consistent production results; to improve physics models used in Advanced Simulation and Computing simulation codes; and to help predict and confirm military performance. Preparations for two major integral tests will be finalized in FY 2004. The tests will include explosively driven experiments to extrapolate material performance models in more realistic weapons environments, provide data to compare Rocky Flats material properties to LANL material properties,and to assist in development of advanced diagnostic techniques for more complex follow-on experiments. The increase in FY 2004 funding reflects increased work scope on subcritical and dynamic experiments to prepare for additional integral dynamic tests which will quantify performance differences that may result from differences in manufacturing processes between Rocky Flats and LANL. These experiments will also be the principal basis for computational ties to the prior nuclear test database. The United States learned about the Chinese theft of the W-88 Trident D-5 warhead information, as well as about the theft of information regarding several other thermonuclear weapons, in 1995. A "walk-in" approached the Central Intelligence Agency outside the PRC and provided an official PRC document classified "Secret" that contained specific design information on the W-88 Trident D-5, and technical information on other thermonuclear warheads. The CIA later determined that the "walk-in" was directed by the PRC intelligence services. Nonetheless, CIA and other Intelligence Community analysts that reviewed the document concluded that it contained U.S. warhead design information. The PRC has the infrastructure and technical ability to use elements of the stolen U.S. warhead design information in the PLA's next generation of ther-monuclear weapons. If the PRC attempted to deploy an exact replica of the US W-88 Trident D-5 warhead, it would face considerable technical challenges. However, the PRC could build modern thermonuclear warheads based on stolen US design information, including the stolen W-88 design information, using processes similar to those developed or available in a modern aerospace or precision guided munitions industry. The W88 Alt 370 first production unit was scheduled for December 2019. The Alt 370 included a new arming, fuzing, and firing system, lightning arrestor connector, trainers, flight test assemblies, and associated handling gear and spares. In November 2014, the scope of the W88 Alt 370 was changed to include replacement of the conventional high explosive main charges and associated components. Changes in initial cost estimates for the main-charge replacement have been reflected in this SSMP compared to the FY 2016 SSMP. The Alt 370 conversion was scheduled concurrently with LLC exchanges of the GTSs and neutron generators.